Lilyan joins Patriot spies in British-occupied Charlestown, South Carolina, to rescue her brother from a notorious prison ship. She’ll lie, steal, kill or be killed in order to protect her family. Desperate for help, she seeks out Nicholas, a scout with Francis Marion’s partisans. Together the pair set out to save her brother. But will they reach him in time? Or will her growing feelings for Nicholas compromise their mission and send the pair to the gallows? In the port of Charleston, South Carolina, post-Revolutionary War passions reach fever pitch. There, Lilyan’s past catches up with her. As a former patriot spy, she is charged with the murder of a British officer. Thrown into the “Exchange Building” and chained alongside prostitutes, thieves, and murderers, she seeks the courage to survive and the faith to believe she will find her missing child, Laurel. Determined to free his wife at any cost, Nicholas finds himself forced back into a life of violence. Will their love sustain them as they seek word of their missing child? Or is Laurel lost to them forever? Written for the General Market (G) (I) A Kindle Unlimited Reading Collection: Contains little or no; sexual dialogue or situations, violence, or strong language. May also contain some content of an inspirational/religious nature. 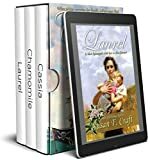 Similar historical novels in this genre may be categorized as: historical fiction, inspirational historical fiction, christian fiction, and clean, wholesome historical fiction.